PCD has released its TXT8030 phone at CTIA trade show. The new twisting phone has been improved to be more flexible than the previous models. 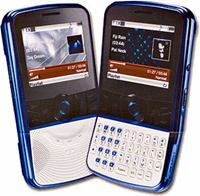 The phone has been designed with the unique twisting option that allows users to twist the bottom half, which one side has a full QWERTY keyboard, while the other side has music control keys coupled with big speakers. The D-Pad remains on the same side as the display. Featured with a 2.2-inch display, TXT8030 is also equipped with a 1.3-megapixel camera. Apart of that, it is Bluetooth enabled and supports up to 16GB microSD. The PCD TXT8030 with measurement of 4.5 x 2.4 x 0.5 inches is expected to be available in third quarter 2009 and the price is not yet announced.